Looking for deals in Santiago de Compostela? Offering free WiFi, a bar, and rooms with private terraces, Capitol Boutique Hotel is located in Santiago de Compostela’s Old Town, just 2133 feet from Santiago de Compostela Cathedral. The best surprise awaited us at the end of our Camino de Santiago- an unexpected upgrade to heaven! It was beautifully appointed, very peaceful and had a lovely private patio. The staff were so lovely and tried hard to please. Located in Santiago de Compostela's historical center, Smart Boutique Hotel Literario San Bieito is 1476 feet from Obradoiro Square. Walking distance to everything. Food & drinks 24 hours included. The modern Hotel Gelmírez is a 10-minute walk from Santiago de Compostela Cathedral and a 3-minute walk from the Train Station’s Airport Bus stop. It has a gym, free Wi-Fi and a 24-hour front desk. Everything, from my first contact with the staff via the internet, through our arrival and friendly, courteous, and professional reception and processing, continuing through our stay, and until our departure. Everything was fantastic. Hotel Praza Quintana is a stylish hotel located in the heart of the historical center of Santiago de Compostela, a 3-minute walk from from Santiago de Compostela Cathedral, Plaza de las Platerías,... The most comfortable bed in the world! Superb location near the cathedral AND quiet! This bright, simple hotel is located close to the old town of Santiago de Compostela, which includes its world-famous Cathedral. Five minutes or less from city center/cathedral. Comfortable, clean rooms. Parking. Very nice receptionists. Set in a renovated 18th-century building, A Quinta Da Auga is a luxury eco-hotel located just outside central Santiago de Compostela. The beautiful property has gardens, fountains and a river. Everything was great. Service is excellent, the staff is extremely attentive and helpful. This former convent has been carefully restored to create a luxury hotel near the center of historic Santiago de Compostela. The building’s ancient features now sit next to modern facilities. Beautiful hotel with quiet, spacious and clean bedrooms. Located in the center of Santiago de Compostela, the modern Hotel Lux Santiago offers free WiFi, a bar and a snack bar. Santiago de Compostela Cathedral is 2625 feet from the hotel. The reception crew were very nice. Hotel Windsor is located in central Santiago de Compostela, 10 minutes’ walk from Santiago Cathedral. It offers a 24-hour reception and air-conditioned rooms with free Wi-Fi and a flat-screen TV. Excellent service, central for sightseeing, lovely, helpful staff. Surrounded by Paxonal Park and 0.9 mi from Santiago de Compostela's old town, Tryp Santiago offers free Wi-Fi throughout. The spacious rooms with modern décor include a flat-screen TV. The breakfast was fantastic. Our room was spacious and clean. Eurostars Gran Hotel Santiago is in Santiago de Compostela, 20 minutes’ walk from the cathedral and city center. It has easy access to the AP-9 Motorway. There is free WiFi. The buffet breakfast is very much worth the 8 euros you pay! We loved it! This historic building is located just 656 feet from Santiago Cathedral, by the San Miguel dos Agros Church. We loved the location and how charming and updated the rooms looked. Pazo de Altamira is a small design hotel, set in a historic building in Plaza de Abastos Square. Great location. Very clean room. Stuff very polite and helpful. Situated in the heart of Santiago de Compostela, this small, friendly hotel offers some of the city’s most affordable accommodations. I liked everything about this hotel. This charming hotel lies in central Santiago, next to Alameda Park and a 5-minute walk from Santiago Cathedral. It is a heritage-listed building with friendly 24-hour front desk and free Wi-Fi. Location and kindness of staff. Antonio and Rosa were particularly kind and helpful in every sense. Located in Santiago de Compostela, within 1.6 mi of Tourism Office and 0.8 mi of Santiago de Compostela Cathedral, Hotel Concheiros provides accommodations with free WiFi. Liked everything about it. Great location, very clean. Easy walk to city and to the bus station. Hotel San Lázaro is located in Santiago de Compostela, only 20 minutes’ walk from the famous Cathedral. Set on Camino de Santiago’s Pilgrimage Route, it offers rooms with free Wi-Fi. Everything was great, its a nice comfortable place! Offering free Wi-Fi, Hotel Exe Area Central is set inside the Area Central Shopping Center, 0.9 mi from Santiago de Compostela’s old town and cathedral. Good hotel with all amenities working well, clean etc. This bright, simple hotel is located close to the old town of Santiago de Compostela, which includes its world-famous Cathedral. Five minutes or less from city center/cathedral. Comfortable, clean rooms. Parking. Located in the historical center of Santiago de Compostela, this hotel is housed in a Galician manor house dating from the 18th century. It offers free WiFi, and a free 24-hour breakfast buffet. The room was amazing- spacious and well- furnished with a lovely view on the city. Pousadas de Compostela Hotel San Clemente is set in a 17th-century building, just 492 feet from Santiago de Compostela Cathedral. It features free Wi-Fi and rooms with satellite TV. The hotel is 3-4 blocks from the cathedral and near almost all other sights. Set in Santiago de Compostela Old Town, this boutique-style hotel is just 328 feet from Santiago de Compostela Cathedral. Free WiFi is offered throughout the property. We loved the room! It had a beautiful design and the perfect amount of space for me and my husband. Just 984 feet from Santiago de Compostela Cathedral, Hotel Pombal is opposite Alameda Park and has 2 public car parks 984 feet away. Free WiFi is offered throughout the property. The staff were very friendly and helpful and spoke excellent English.. Which hotels in Santiago de Compostela have nice views? 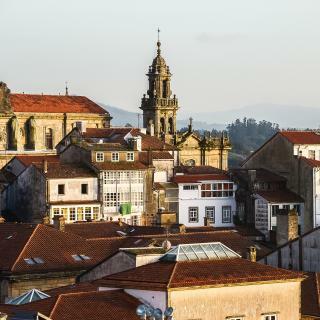 Hotel Gastronómico San Miguel, Hotel Pazo de Altamira, and A Quinta Da Auga Hotel Spa Relais & Chateaux got great room view-related reviews from travelers in Santiago de Compostela. What are the best hotels in Santiago de Compostela near Area Central? Some of the best hotels in Santiago de Compostela near Area Central include Hostel SCQ, Hotel Concheiros and Apartamentoracafer. What are the best hotels in Santiago de Compostela near Santiago de Compostela Airport? Travelers who stayed in Santiago de Compostela near Santiago de Compostela Airport (SCQ) have said good things about Hotel Garcas, Hotel Amenal, and Ruta Jacobea. How much is a hotel in Santiago de Compostela for tonight? On average, it costs $59 per night to book a 3-star hotel in Santiago de Compostela for tonight. You'll pay around $88 if you choose to stay in a 4-star hotel tonight, while a 5-star hotel in Santiago de Compostela will cost around $129, on average (based on Booking.com prices). Which hotels in Santiago de Compostela are good for couples? These hotels in Santiago de Compostela are highly rated by couples: Hotel Altaïr, Moure Hotel, and Hotel Praza Quintana. How much does it cost to stay in a hotel in Santiago de Compostela? On average, 3-star hotels in Santiago de Compostela cost $60 per night, and 4-star hotels in Santiago de Compostela are $84 per night. If you're looking for something really special, a 5-star hotel in Santiago de Compostela can be found for $146 per night, on average (based on Booking.com prices). Which hotels in Santiago de Compostela offer an especially good breakfast? For hotels in Santiago de Compostela that serve highly-rated breakfasts, try Parador de Santiago - Hostal Reis Catolicos, A Quinta Da Auga Hotel Spa Relais & Chateaux, and NH Collection Santiago de Compostela. Which hotels in Santiago de Compostela are good for families? 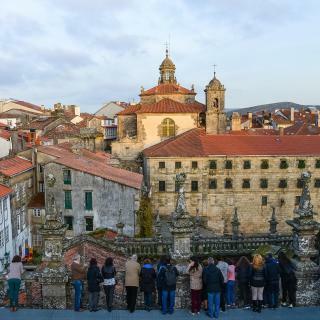 Many families visiting Santiago de Compostela loved staying at Hotel Praza Quintana, Moure Hotel, and Hotel Atalaia B&B. Which hotels are the best ones to stay at in Santiago de Compostela? 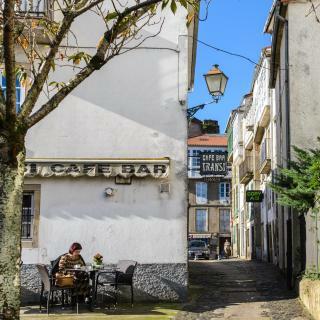 Hotel Praza Quintana, Hotel Atalaia B&B, and Smart Boutique Hotel Literario San Bieito are some of the popular hotels in Santiago de Compostela. How much is a hotel in Santiago de Compostela for this weekend? The average price per night for a 3-star hotel in Santiago de Compostela this weekend is $136 or, for a 4-star hotel, $174. Looking for something even fancier? 5-star hotels in Santiago de Compostela for this weekend cost around $197 per night, on average (based on Booking.com prices). The city of Santiago de Compostela is the capital of Galicia and the place where the Apostle St. James is buried. The city’s Old Town is a UNESCO World Heritage Site because of its distinguished old monuments around the Cathedral and the tomb of St. James. Made of granite, the spectacular Baroque facade of the Cathedral of Santiago de Compostela features massive bell towers and statues of St. James. The Obradoiro facade of the Cathedral is one of the most exceptional examples of the Spanish Baroque period. Surrounded by magnificent buildings, the monumental square of Plaza do Obradoiro is one of the most historic squares in the world and the heart of Santiago. You can stay in one of the hotels, guesthouses or apartments Booking.com has near this majestic square. 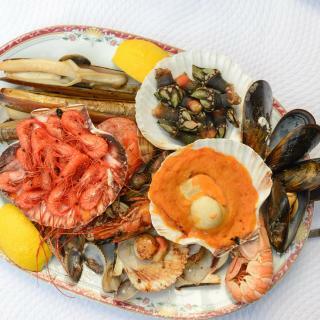 The final destination of the medieval pilgrimage route El Camino de Santiago, this city is the best place to enjoy fresh fish and traditional Galician bread. 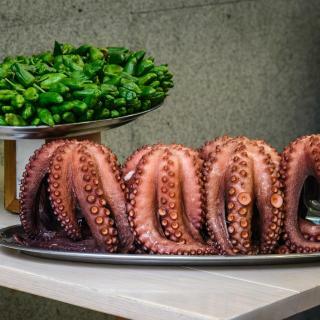 Galicia is the seafood capital of Spain and the right place to savor Salpicón de Mar (seafood salad) and Pulpo á Feira (octopus cooked with salt). The Christian pilgrimage route of the Way of St. James passes by Santiago de Compostela Airport, just 9 miles away from Galicia’s capital. Santiago Compostela is fantastic. The history is incredible and the Cathedral is not to be missed. Local food,wine, and sights are only outdone by the friendliness of the locals themselves. Do yourself and your wallet a favor and visit this inexpensive and incredibly beautiful place. As anticipated the town is a historical and spiritual experience. The narrow and winding streets are enjoyable, with great photo opportunities. The many bars, cafés and restaurants offer a variety of options and are usually packed even in low season. Great ending destination city for Camino travelers. Santiago is very special to me — I walked the full French Camino from St. Jean Pied de Port to Santiago (about 500 miles) after years of dreaming and planning. It was a lifetime achievement for this 70-year-old retired teacher! So much history connected to the Camino. It was a wonderful experience walking into Santiago at the end, even if it was pouring cold rain! It's a very small town, famous as the end of Camino de Santiago (the road of Santiago, a pilgrimage). So the atmosphere is very vibrant, you can see pilgrims everywhere. 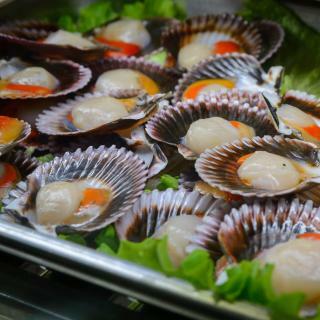 The food is delicious, especially seafood, we also had great vermú. Although I wouldn't recommend to plan mire than 2 days there ( we stayed 1 day and viaited all the historic attractions). I was a pilgrim walking to Santiago de Compostela, so it was great to see other pilgrims arriving at the Apostle’s tomb. I was impressed with the cathedral and its museum. The appeal to me was the combination of the historic building and the modern people praying in it. Another perfect host and room in Spain. The room was large and had very beautiful interior, the beds were comfortable and the bathroom big and nice. We had no problem with noise from the street since we closed both layers of the window. We had no neighbors so I can't say anything about that. The host is very friendly, communicative and wants to make your stay perfect. The old town is a 10 min walk away. The parksides are at the back of the house. Absolutely the best accommodation in Spain so far. Close to everything we wanted to see, very clean, fantastic large screen tv with Netflix, in English, very friendly helpful staff, at the point where the pilgrims come into Santiago from the long Camino walk ending up at the Santiago Cathedral. We had three very relaxing and interesting days in this lovely north west corner of Spain. This is a wonderful little boutique type hotel tucked into a quiet side street but just steps from the restaurant district south of the Cathedral. Perfect location. I had the room off the patio which was super quiet for this tired Pilgrim. I’ve been to Santiago several times now and am always looking for a ‘gem’. Host (Mary) couldn’t be more warm & welcoming. Rooms are beautiful, big. I've never seen a bathroom so clean either :-) Very central in Santiago old town. Super comfy beds, bed lining, pillows.... totally loved it there. Can't comment on breakfast as we didn't try it- there's lots of bars and cafes around the hotel so we preferred to eat there. Really nice, small hotel, feels like you're staying in someone's house. Very quiet. Had a lovely, comfortable room with a view of the Cathedral. Great start to my trip in Northern Spain, the hotel had character. Hotel staff nice and friendly. Breakfast was nice too! Great coffee! Great location in the centre of the old town. The hotels is very clean and welcoming. Staff couldn't be nicer. Our room had window that opened to a lovely view of cobbled stone streets. We will definitely be staying there again when we return to Santiago de Compostela. Beautiful historic hotel. Comfortable beds and pillows. Helpful staff. Excellent location. Stayed in November, room was a little warm for our linking. Opened the window and solved the problem. Some street noise though. Would stay here again if ever in Santiago. After the santiago pilgrimage, I was very happy to stay at this hotel. Staff friendly, clean accommodation, comfortable relaxation, especially the train station is 5 minutes away and it is best to go to the next city. I liked the room with parking, AC and very helpful staff. I don’t recommend this breakfast. Too crowded in small area and food was not fresh in my opinion. And I do NOT recommend the hotel to cyclists of any kind. Everything was fantastic! The room is really wonderful, very cozy, very modern, very functional, very clean and dry! The breakfast was the best of our trip around Spain! And the staff was great! Tks for everything! Only a night before start the Camino. Position is very good, few minutes from the Catedral. Staff was really good and at the reception the girl spook english very well (not easy to find it in Spain). Very comfortable and clean hotel with a spacy room. You can park the car in the hotel garage for 9 EUR and reach the old town of Santiago by bus in 4 stops for 1 EUR. Great location, very clean and modern, cleverly designed, very helpful staff, great view of the cathedral. One of my best rentals in Spain! Great small hotel in Santiago de Compostela! 2nd time there as good as the first. The staff from the front desk to housekeeping were excellent. I had several travel related questions and they were happy to assist me. Everything exceeded our expectations. I have stayed here two times and will book again.